Hairball Awareness Day: Making Whoopi! Snuggle buddies come in all shapes and sizes, and some are more surprising (and much cuter!) than others... Like this baby rat and his kitten friend. Little rattie just crawls under the kitten's arm and gets as close as he can. Then he makes his way up to his face and cuddles his cheek. It's tough to find the comfiest position when they're all so comfy! BONUS CUTE: More rat and cat love! If your cats are lazy creatures who just lounge around the house all day napping and eating, then you better show them this video ASAP. Turns out some cats are actually pulling their weight around the house and earning their keep! Where can I get an enthusiastic dishwasher cat like this? I hate dishes almost as much as I hate putting away laundry... He'd be a huge help! BONUS CUTE: Perhaps you'd prefer a doggie dishwasher instead? Today is Hairball Awareness Day! And to celebrate, a bunch of us bloggers made celebrities out of cat hair. 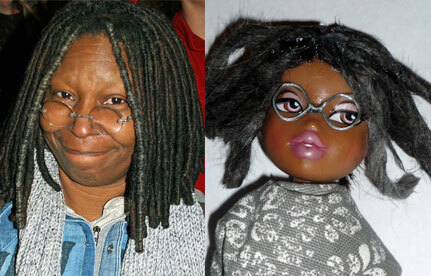 I made Whoopi! What do you think? Not bad for cat hair, huh? P.S. You can see even more fur creatures on FURminator's Facebook page. Some are really silly! Why fetch mice or balls when you can fetch an entire towel and run back with it awkwardly dragging between your legs? Mice and balls are so easy to carry back... kitties like Champloo here like to go for a challenge! You think Champloo is cute? There's more cute where that came from! Why not subscribe to Your Daily Cute by email so you don't miss it? Milo has an automatic feeder that drops dry food three times a day, but that's not enough as far as he's concerned. He takes a running start and bashes into it 20 to 30 times a day to shake out extra snacks! This is two days of non-stop feeder frenzy by Milo. You can see his brother, Max, looking on at him like he's nuts. His people ended up thinking he was nuts, too, and they switched to a regular bowl so he won't get too chunky from the constant snacking. Thanks to Cute's fab friend, Keely, for sharing this cute cat vs. feeder video! In the latest video proving why animals are such amazing creatures, Koko the gorilla gets to pick a playmate from a litter of five adorable kittens. He takes a look, reaches into the carrier and chooses his favorite. It's a sweet orange baby, and Koko is incredibly gentle and loving with him, like he knows he has to be extra careful as if it was his own baby. Koko cradles the baby and pets him and even shields his head as he closes the carrier door. And notice how not scared the kitten is, like he knows that Koko is a friend who won't hurt him. Don't you just love relationships between animals? If your kitty could use a little zen, bring him over to your computer and play him this step-by-step cat yoga video. Shorty the cute black kitten demonstrates all the moves as you go, so it's easy to follow. Some are more challenging than others (particularly that headstand one, you'll see), but tell your kitty to just keep trying! You want to play hide and seek with a kitten? You can try... but they know where you are... and they are not afraid to swat at you when you come close to their hiding place! P.S. So yesterday I was going to run the 7 Mile Bridge Run in the Keys. I went out... It was pouring! And lightning and thundering really. My friend and I were really questioning our sanity, but if they didn't cancel the race, we were going! I mean, we drove three hours for this and paid for a hotel stay! Anyway, we went to the start line. We stood in the pouring rain, distant thunder and impending lightning like idiots. Adventure! And one minute before the official start, they cancelled the race. I'm kind of relieved, because I was really doubting my senses, but I didn't want to quit. So, thankfully, they quit for me.